Marble: Marble has long been valued for its beauty, unique veining, strength, and resistance to fire and erosion. Marble is formed from Limestone by being exposed to extreme heat and pressure from the earth the Limestone to change in texture and makeup. 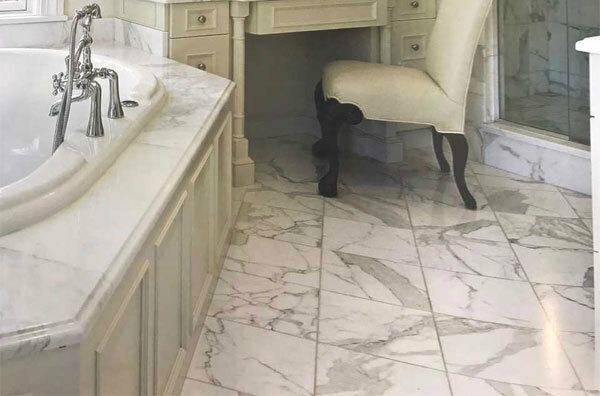 Marble tiles are available in several surface finishes including: polished, semi-polished, honed, or tumbled. Granite: Granite tiles are extremely hard and scratch-resistant. A crystalline, platonic rock formed by slowly cooling magma of various colors, Granite contains 3 main minerals: Quartz, Alkali Feldspar, and Plagioclase Feldspar. Granite tiles are most often used in a polished surface finish. Limestone: Limestone is formed over many years at the bottoms of oceans and lakes from the accumulation of shells, bones, and other calcium-rich goods. Limestone is a softer, more open, poured stone which is normally used in natural unpolished looks, without any gloss like marble. Travertine: Travertine is limestone that has deposits of calcium crystals in layers on the surface. This product is porous with many visible holes. Travertine can be filled or left unfilled for a more rustic appearance. Slate: Slate consists of grains of Mica and Quartz. Slate results when the earth’s crust squeezes these minerals into parallel layers. This stone is split into thin sheets rather easily. Slate tiles typically have an irregular surface, as opposed to the smooth finish of many other stones. Onyx: Onyx is an agate-like stone often translucent with a layered appearance. It is formed in cold mineral springs by calcite precipitation. Onyx tiles traditionally have a polished surface to enhance the translucency.